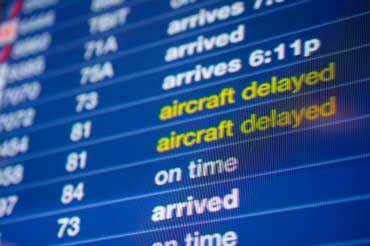 How do you know if your flight is cancelled? Flight schedules and cancellations are posted on bulletins in the airport. Be sure to check the schedules. Some flights are on time and others are late. 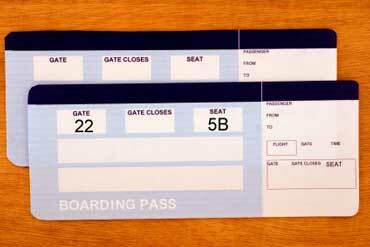 A boarding pass is a paper that has information about your flight. This boarding pass is for Gate 22 and Seat 5B. What is the check-in area? 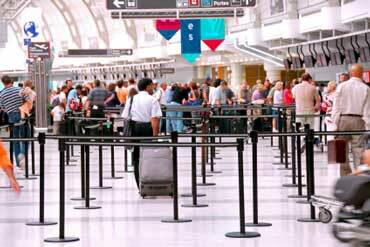 The check-in area is where travelers check-in their luggage. They also let the workers know that they are there. Copyrights to the pictures and photos on this ESL and EL Civics website belong to individual photographers. We have purchased the rights to use them. Do not copy the images on this website. Permission is granted to copy any of the worksheets for classroom or home use. You may link to any page of this lesson. Contact Christina Niven, ESL teacher, at christina@elcivics.com. Please send corrections, comments, and requests for lessons. Copyright © Christina Niven, 2007.